The VR30DDTT: Nissan’s new Twin Turbo Engine! If you’ve been following the automotive-related newsreel lately, you’ve probably heard about Nissan’s new engine: the VR30DDTT. 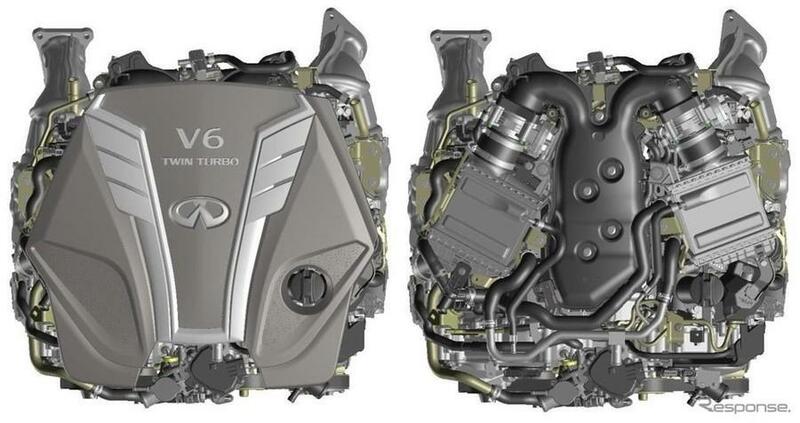 If the naming scheme sounds familiar, it’s probably because this engine incorporates design elements from two very prominent engines from Nissan’s history: the VR38DETT found in the R35 GT-R (and almost in the V37 Infiniti Q60 Eau Rouge, before that was scrapped), and the VG30DETT, found in the Z32 TT, and Nissan Mid4 II, if that counts. 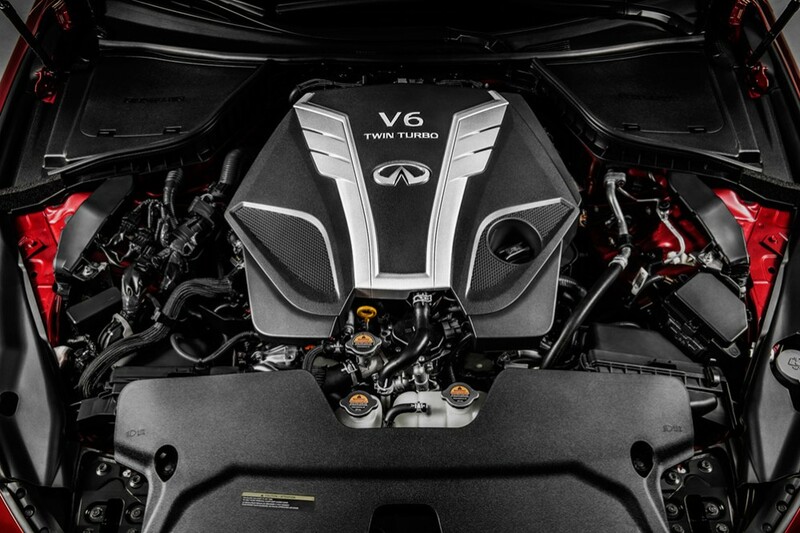 The new motor will find it’s way to the Infiniti Q50 later this year, and will be with the 2017 Q60 (replacement for the G37 Coupe) at launch. Ninja Edit: We’ve confirmed Nissan is actually going to call this the VR30DDTT, because it uses direct injection. But the VR30DDTT is, or at least appears to be, very different from these two engines. It will be available in 300HP (which, to point out, is less than what the current VQ37 produces), and 400HP trims, making 295 and 350 ft-lbs of torque, respectively. Interestingly, both configurations will produce their peak torque numbers, all the way from 1600-5200 RPM. 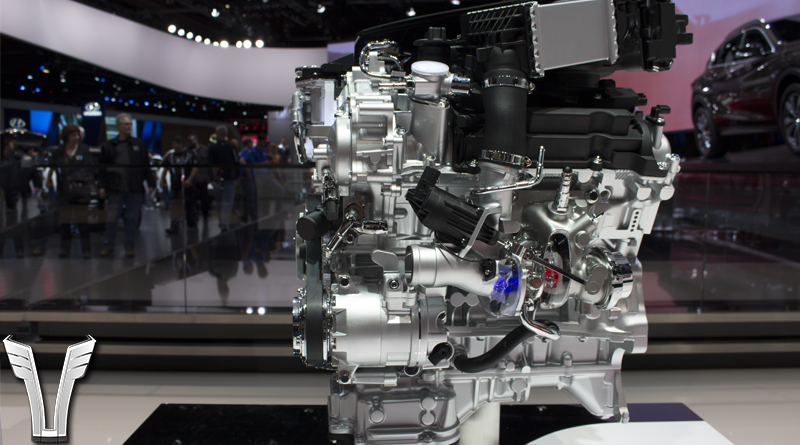 Like the VG, the VR30DDTT is a 3.0L V6 with parallel twin turbochargers. That’s about the end of the similarities. What it shares with the VR38 is yet to be seen, but more than likely this will be mostly in the DNA found in the construction of the block and heads. But that’s pure speculation at this point. So, let’s take a look at the highlights, or what we do know. Now, let’s dissect some of the more interesting points there. First, the VR38 and (obviously) the VG30 use port fuel injection. This means the fuel is injected into a port upstream from the cylinder as it’s drawing air in. 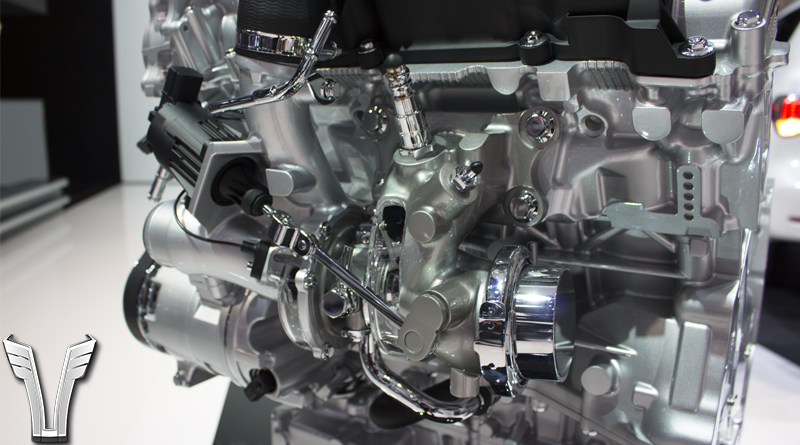 The VR30 uses direct injection which, for those who don’t know, injects fuel directly into the combustion chamber. The downside here is expense, potential points of failure, and of course increased difficulty for the aftermarket/tuning crowd (hi). The upside is, because the ECU can inject fuel in an extremely precise way, the possibility of detonation is greatly minimized, which is also why Nissan was able to push the compression ratio up to 10.3:1. Electronic wastegate actuators. Can’t wait to get my hands on these! 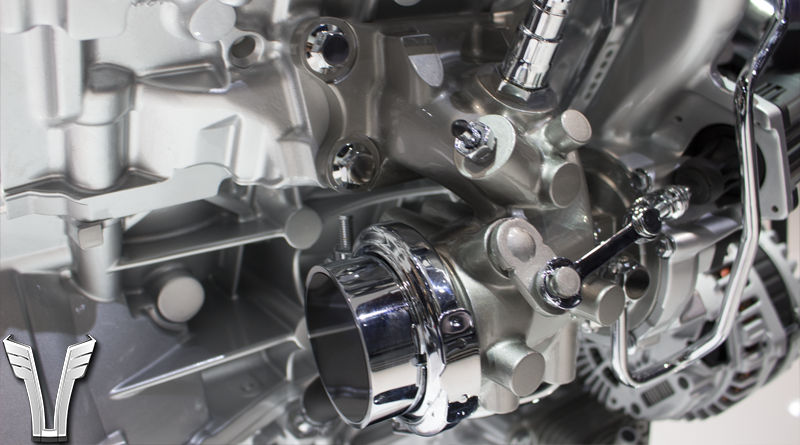 You can also see the unique way the turbine housing mounts directly to the cylinder head here. In the above picture, you can also see the optical speed sensor on the front of the compressor housing. This sensor will inexplicably allow it to spool 30% faster than the 300HP model, and bring the turbos up to ~240,000 RPM. Why a speed sensor is required to do this is a bit of a mystery to me, and likely won’t become clear until the ECU is reverse-engineered or explained by someone at Nissan. My knee-jerk reaction is that any behavior changes made on the 400HP model could be applied without a sensor. Second, those electronic wastegate actuators. Oh those sound fun, and I personally think we’re going to see those or similar designs start working their way into aftermarket off-the-shelf setups. A boost-controlled setup relies on vacuum/boost signal to actuate the wastegates. This can be difficult to control and inaccurate, plus leads to complicated routing of vacuum hoses, boost control solenoids, etc. Making these electronically controlled means the ECU will have extremely precise control over the opening rate of the wastegates, which means it can pull off neat tricks like keeping them closed completely until it’s ready to pop them wide open. In comparison, doesn’t the old way seem draconian? The inlet side of the LH intercooler. It sits neatly under the engine cover; you’d think this was any other intake manifold if you didn’t know. 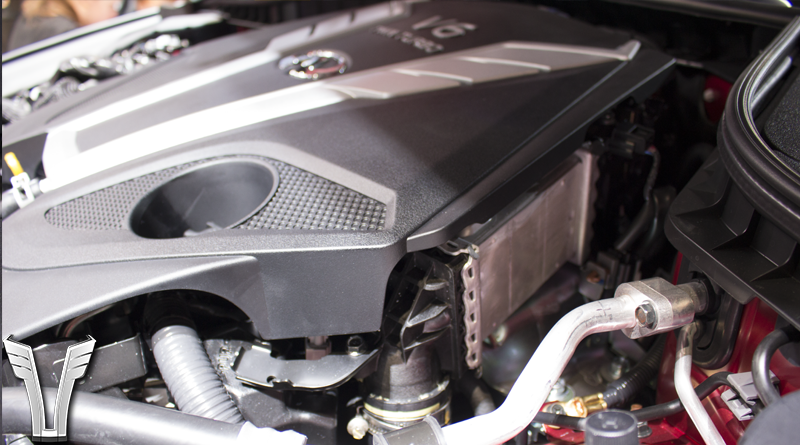 Twin Water-to-air intercoolers is a new one, in the Nissan performance engine book, at least. While it may be annoying to have to keep an eye on another liquid, Z32 and R35 owners will appreciate how this simplifies the intake tract. In the Z32, for example, air starts at the filter, travels through the MAF, under the headlights, down to the turbo inlets, out the turbo outlets, over the front of the engine bay, down by the radiator, across the intercooler, back up by the radiator, across the engine bay again, and into the throttle bodies. Whew. On the VR30, air will travel from the turbo inlet (we don’t yet know what the intake tract is like upstream from that), then out the turbo outlet, through the intercoolers directly on top of the engine, and into the throttle body. That’s it. The turbine housing bolts directly to the cylinder head. Also of interest is the upstream oxygen sensor, pre-turbo. This is somewhat difficult to pull-off, especially considering Nissan has switched to wideband upstream sensors since ~06, and these sensors tend to be much more sensitive to extreme heat. Also, is that a V-band downpipe connection?! 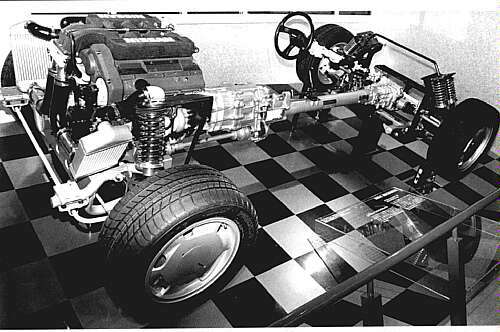 The last thing that really piqued my interest were those integrated exhaust manifolds. Nissan has dabbled in ruining experimenting with the way turbos mate up with the heads in the past. While the VG, RB, and SR have traditional setups, the VR38 integrated the exhaust manifold into the turbine housing. It allowed them to make a more compact setup, without sacrificing flow. In the press release, Nissan claims the VR30’s manifolds are integrated into the head. They kind of are. Basically, the first half of the manifold is integrated into the head, so that’s all cast aluminum still. Then, prior to where you would normally have a 4-bolt flange, the turbine bolts directly to the head. So it’s more like, half of the manifold is integrated into the head, and the other half is integrated into the turbine. I suspect Ishikawajima Heavy Industries is supplying these custom turbines, since it’s likely Nissan asked them to reprise their roll they played in the VR38’s design. I’ll end this article with a few more pics and commentary below. Pictures & info sourced from BoostAddict, TheVRForums, and Infiniti. See that single, rubber coupler? Beats the hell out 20ft of intake piping! That water-to-air intercooler peeking out from under the engine cover. The front of the engine. Very similar to the VQ and VR38. 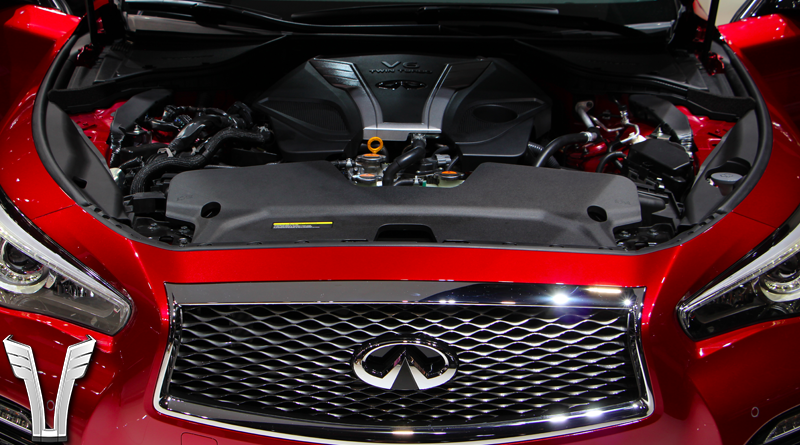 As it sits in the engine bay of the 2016 Q50. Thank you, to whoever at Nissan decided the public needed colored/textured renderings! Why those injectors can be a problem? I agree, there’s TONS of potential there, much more than port injected injects. The injectors are just more expensive when you need higher flow rates, that’s all. Thank you for sourcing us and using our pictures! Great article! Only thing is that there are conflicting reports on whether it will be called VR30DETT or VR30DDTT. That’s true! We’re all just guessing at this point. And thank you for posting the great pics and info to begin with! 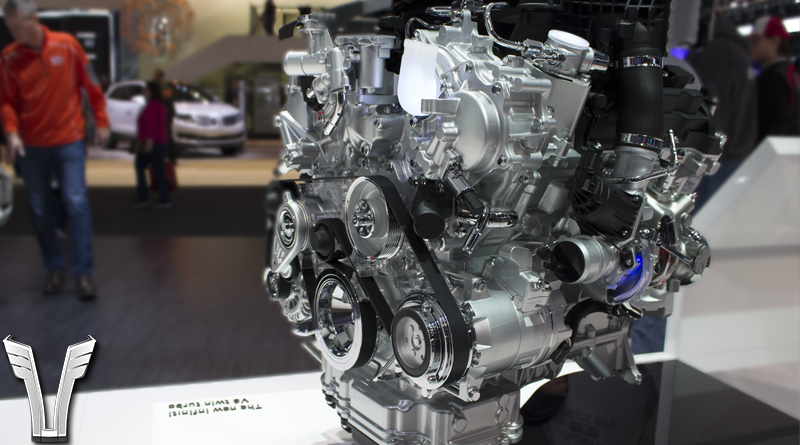 long long gone are the days of beautiful engines yet on this topic all of this technology on the V6 is already applied to Subeys and Mazdas. Mazda will even be one of the first to emply HCCI no sparkplugs and has been using higher comp ratios with boost for some time now. Nissan needs to bring out something more than what others have already done maybe time to talk to a certain swede hypercar designer for some better heads that are way less complicated than current trend. Um, did you miss the variable compression engine? I’d say that’s fairly remarkable, although not in the performance world… yet. Yup, but, what’s that have to do with the VR30? Interesting. 10.3:1 compression goes against the argument that lower compression is better turbo cars (at least on the VG). Looks like Nissan thinks higher compression is more beneficial. Turbo speed sensors are beneficial to control the wastegates and let the turbocharger spool to its max speed. Without the speed sensor, you will know how much mass flow is coming out of the compressor through MAP sensing and other sensor values and then be able to speed the turbocharger up or down through actuator control but you still dont know exactly how fast the compressor/turbine is spinning. This could be estimated through loading the real/raw compressor map data into the ECU and referencing this while taking data from the other sensors. They likely used a speed sensor for turbocharger safety and to squeeze optimal performance out of the compressor and turbine. If you over speed the compressor, you run the risk of moving past the material strength and causing catastrophic failure. 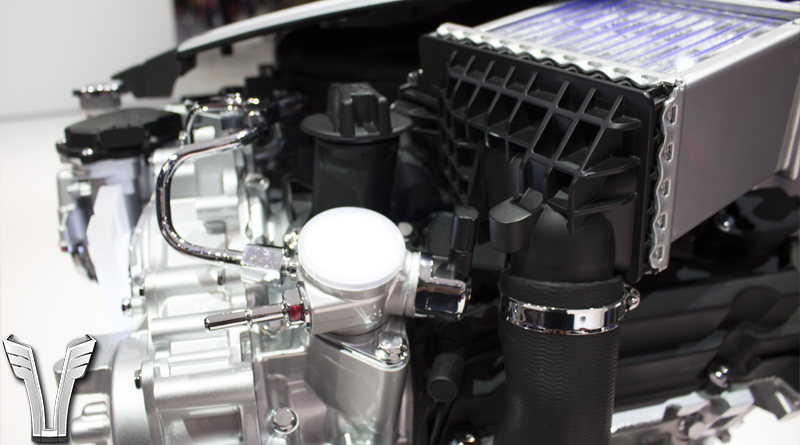 The sensor allows for much more control over turbocharger performance. The turbo speed sensor is used to control surge/choke on the 400hp model, because the turbo is spinning faster on the 400hp model, its more likely to hit turbo damaging surge/choke conditions, the ECU can calculate these conditions with the speed sensor and adjust the waste-gate / turbine speed to avoid them. Yeah, we’re thinking it’s a part of a greater control system that uses input from the speed sensor, IATs, boost pressure, etc and uses the electronic actuators to really finely control the boost pressure. We picked up one of the actual turbos and they’re insanely tiny, smaller than Z32 turbos, so they are running these things to their absolute limit.